Maravilla Resort Community in Destin, Florida offers a beautiful large private beach, tennis courts, two swimming pools, club house facilities, barbecue grills and a fitness center. The resort's private beach is 2.5 acres of sugar white sand along the beautiful Emerald Coast of the Gulf of Mexico in Destin Florida. Beach service for umbrellas and chairs is included with all rentals. There is a volley ball court set up at the beach for the enjoyment of owners and guest. The beach service also rents kayaks and boogie boards. The gulf front pool is a favorite of Maravilla visitors. The club house pool and the hot tub are heated during cooler weather. Tennis courts and the fitness center offer the guest hours of great physical fitness while enjoying their time at Maravilla Resort. The clubhouse, suitable for family functions, is equipped with a kitchen and a large screen TV, and can be reserved by guests of Maravilla for an additional fee. There are three large grocery stores located within two miles of Maravilla as well as other popular shopping destinations including the Silver Sands Outlet Mall and the new Destin Commons Shopping Center. 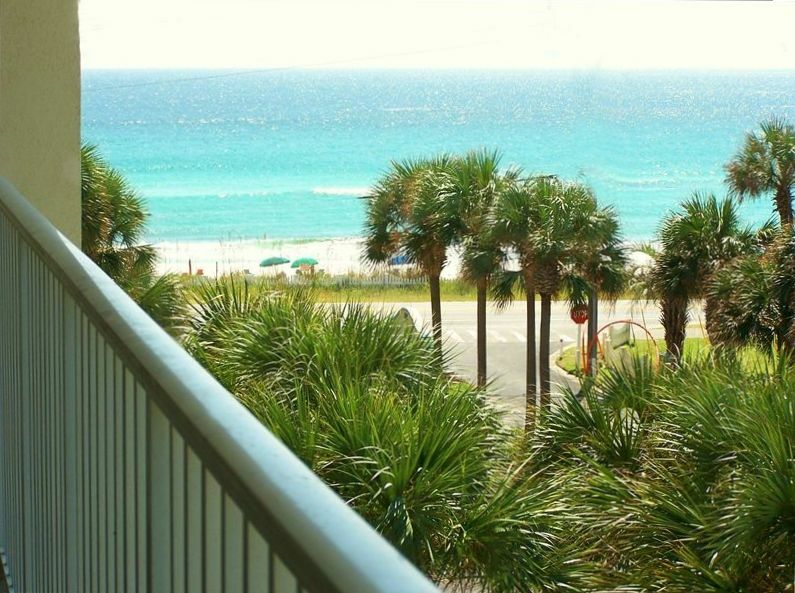 The Scenic Gulf Drive area of Destin has miles of biking and walking paths enjoyed year-round by visitors to the area. There are bike racks located at Maravilla to secure your bike during your stay. Local vendors have bike rental shops. Beautiful beach with beach service provided, tennis courts, fitness center, miles of bike/walking paths with a view of the gulf, large beautifully decorated condo with a view of the gulf, restaurants, shopping, fishing, golfing. Condo was sufficient for what was needed. Plenty of room & really liked it having 2 bathrooms. Had everything we needed to fix our meals. Was easy to get to beach. Wasn't as close as I had hoped. I like listening to the waves at night. The only thing we noticed, was the floors were not as clean as you would expect. It didn't take long for my granddaughter's feet to get really black. The other tenants were very friendly & we enjoyed having our dog with us. All in all we had a good time considering the cooler weather, but it was November, next time I will try for a little earlier in the season. Thank you Patricia for your review. It is unfortunate that we had an unseasonably cool time during your visit. I wish that you had called us about the cleaning and issue and we would have addressed it. We work very hard to be sure that our guests have a good experience. I loved how the condo was decorated. It was homey and inviting. I hated to leave. I will come again next year- We are already looking forward to it. Amazing view of beach & community plus awesomely decorated....PERFECT!!!! From check in to departure the condo was absolutely perfect! Clean, gorgeously decorated yet not overpowering w/beach decor but more of a Tuscany feeling also. When you are sitting on the patio @ nite peering out to the community across the way it just feels so warm and comfy listening to the waves roll in. The beach chair guys are more than accommodating and yes please consider a TIP because that's some hard & hot labor performed by them yet with a smile on their face all day! We will definitely ask for this particular unit in this complex when booking our next trip!!! We have stayed at Maravilla for several years and have always been pleased with the overall experiences. This condo was very nice, but not as clean as expected. It’s a pet friendly unit and therefore we found a lot of pet sign throughout the unit. We are so glad that you had a good time and enjoyed the condo overall. We make every effort to remove all pet hair each time but sometimes there may be a small amount remaining. We would be glad to return and address any cleaning issues that are needed. This condo is in need of a makeover. Multiple issues. As a small Boutique Mom and Daughter rental company, we pride ourselves on customer service and connecting with our guest to be sure they know we are here to help them achieve a wonderful vacation. We always ask that guest make us aware of issues during their stay so that we have to opportunity to address and correct. In this case the issues were not brought to our attention until after the guest left and came with demands for compensation that were unreasonable and threats of a bad review. Additionally this guest left the condo in disrepair and took items from the unit that cost us to replace. Among all of our properties we have 1000s of guest each year. Our guest, like people in general are almost always amazing and while we always try our very best to avoid issues things do come up. Generally, most people understand, that like your home things will come up from time to time. We are so very thankful to our guest for working with us and allowing us to help them achieve a wonderful trip to the beach.